If you, too, have wished Vancouver’s vacant urban land could be transformed into something positive and nurturing for our community, you’ll be happy to learn about Sole Food. They’re a 5-year-old not-for-profit social enterprise building a realistic model for urban farming in Vancouver’s Downtown Eastside and they have a goal to raise $100K. If there was ever a cause to support, this just might be it. Read more about their social goals here and watch this video. As for Sole Food’s artisan quality fruits and vegetables? They have klout. 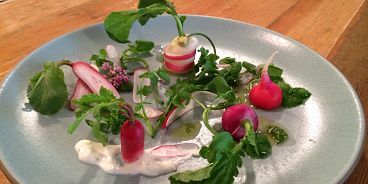 Top chefs in the city, like Burdock and Co’s Andrea Carlson, use many of their beautiful ingredients in their dishes. It’s no wonder this young company won “supplier of the year” at this year’s Vancouver Magazine Restaurant Awards. In support of Sole Food’s crowd-funding campaign, Chef Andrea has created a special recipe using their newly in-season ingredients. 1. Cut radishes into playful shapes, some with green tops standing upright, others with root ends pouted upright, some into thin slices lengthwise. 2. Assemble these on round plate. Sprinkle lightly with maldon salt. Place dollops of chive cream of plate in varying sizes. 3. Set small mache clusters in amongst the radishes and place crisps in between as well. 4. Finish with a few mounds of lovage ice and drizzle all with light olive oil.